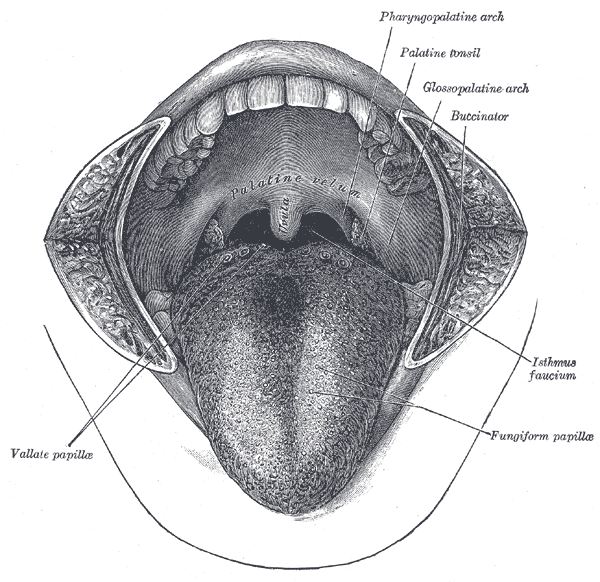 …when by some accident he suffered it to enter the nostril through which it passed and fell into the pharynx. Well, that’s what happens if you insist on ‘irritating’ your nostril with a needle. The pharynx is the upper part of the throat, immediately behind the mouth. The needle was armed with a large thread, which disappeared entirely. Much irritation and cough were excited, by which the thread of the needle was thrown out. The patient endeavoured by means of the thread to extract the needle, but in vain. This is the point at which I think I would progress from desperation to blind panic. The respiration and voice becoming affected, and renewed attempts at extraction failing, the patient entered the hospital Beaujon, on the 18th of June 1828. The symptoms of inflammation, swelling, &c. in the pharynx and larynx were now considerable; the voice was nearly lost, spasmodic contractions of the muscles of the neck were excited, and the soft parts in front of the trachea were much swollen. A medical student attempted to use the thread – which was sticking out of the man’s mouth – to retrieve the needle, but was also unsuccessful. Exasperated, he sent for the surgeon, a Monsieur Blandin. The thread had now re-entered the pharynx, and all researches by means of the finger and forceps would not enable him to determine where the needle was fixed, whether in the larynx or pharynx. As the difficulty of respiration was still supportable, no operation was undertaken, but antiphlogistics, general and local, were employed with some advantage. Laryngotomy is a surgical incision through the larynx. The concept is very similar to that of a tracheotomy – maintaining the patient’s airway by making a new opening to admit air to the trachea. …by making a cautious dissection through the indurated and swollen parts, in front of the larynx, then carefully puncturing the crico-thyroid membrane, and afterwards dividing, by means of a director and bistoury, the thyroid cartilage, through its whole length on the median line. ‘Cautious’ dissection is all very well, but this was 1828, nearly twenty years before the advent of anaesthesia. The patient cannot have enjoyed this procedure. The respiration was now much relieved, and an attempt was made to discover and remove the needle by means of the forceps; but the irritation excited was so great as to induce the operator to desist. The wound was lightly dressed by means of a perforated compress covered with simple cerate, and the patient removed to bed. Cerate was a waxy ointment often used applied to cloth and used as a dressing. The night was passed comfortably, and the next day the needle, of a black or bronzed colour, and nineteen lines in length, was found fixed in the compress covering the wound. A ‘line’ is a twelfth of an inch – so the needle was slightly over an inch and a half (3.9 cm) long. Its abrupt reappearance, embedded in the dressings, was a remarkable stroke of luck for the doctors; I find it strange that no comment is made about this fortuitous development. Which is perhaps the most French thing that could possibly happen at that juncture. The wound gradually healed, so that by the beginning of September merely a small fistula [opening] remained, but the voice was hoarse; there was some pain at the larynx, and other indications of chronic inflammation, for which leeches, a seton, &c, were prescribed with little advantage. A seton is a loose stitch placed in a fistula (anomalous opening) to facilitate its closure. It is still a commonly-used surgical technique. The treatment was however continued, caustic was applied to the fistula, so that by the 30th of September the sinus was closed, and the voice acquired more force. This reminds me of the woman whose story was told in The Guardian’s “Experience” column some years ago. She was a professional seamstress and was known to hold pins in her mouth. One day, she swallowed one. I don’t remember how much time went by (days, I’m thinking) when it was discovered she had inhaled the pin rather than merely swallowed it. It was eventually removed. Thanks for your comment. Unusual to hear about a recent case. In the Victorian journals they were almost commonplace – here’s one example I’ve written about before, but there are plenty of other good stories which I may make use of in future!